Throw everything together in a bowl and stir. Yup, other than the actual cooking, that’s about it! Heat oil in skillet over medium heat until the oil begins to shimmer. While the pan is heating, make your cakes by scooping the salmon mixture into 1/4 – 1/2 cup gobs. Work each gob into a ball with your hands, and then flatten them slightly to form cakes. Place carefully in hot pan. Fry for approximately 10 minutes, flipping every so often to prevent burning. TIP: Flip carefully, as the cakes are delicate until cooked through. And now you are DONE! Off to the next thing, which is likely eating dinner…. This entry was posted in Lunch and Dinner, Recipes and tagged gluten free, quick and easy, salmon. Bookmark the permalink. 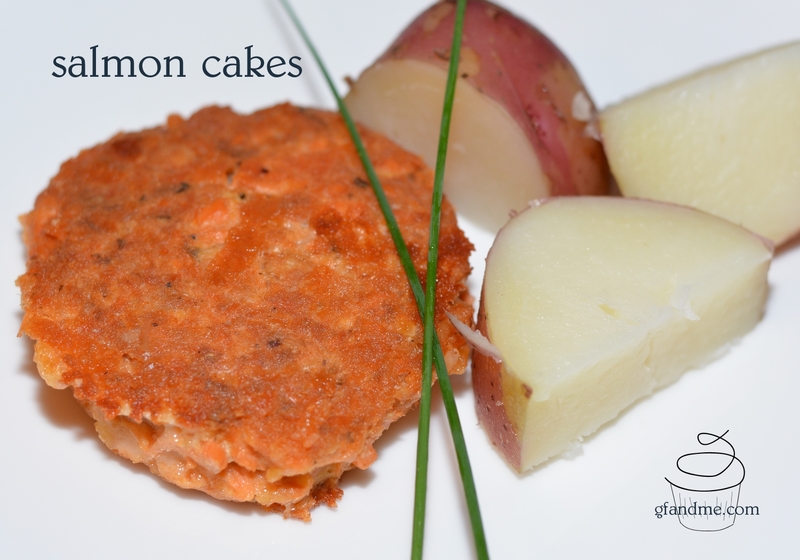 Love salmon patties! My recipe is a little different, but it was really easy to convert to gluten free. They are great aren’t they! So easy to make. Definitely, going to make these.